My problem is that it clearly isn't her first time regenerating, otherwise how on earth did she know what was about to happen before it did? Could be some kind of innate knowledge? No idea. Just know there are major spoilers. Heard some theories that a baby born in the TARDIS can regenerate. :/ Maybe cos of the energy thing that I forgot what it's called located at the heart of the TARDIS. Overnight (not final) ratings for Day of the Moon. Conclusion? Revise the ****ing timeslot and stop trying to bump up your other crap shows. The girl's dialogue implies that this isn't the first time she has regenerated. The Future Doctor said he had been running. The Current Doctor chooses to run off to adventures instead of finding the little girl. He says you only live once. I think he knows. I have the strangest feeling she'll find us. I thought that as well, not sure if I said on here, the other thread or just to my sister when she watched it last night. He definitely has realised something he's not letting on. 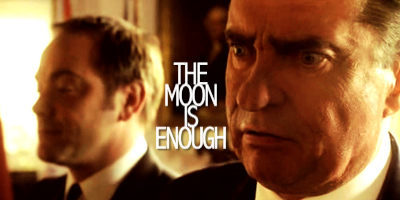 Moff has said the Doctor's mind is always 4/5 sentences ahead of his speech. He's doesn't even really give them the choice and chooses himself to run off and not find out about the girl. I wonder why none of them really looked when they found the space suit empty. At that point the girl was only down the corridor. I don't think so, although how would the Doctor have known? Something tells me that it is taught to young time lords/ladies and isn't an innate knowledge. Although the Doctor did say that it was 'a shared knowledge and a shared suffeing' when describing what a Time Lord is to Jenny. River is Amy's daughter, the Doctor's wife, and a sonic screwdriver. I actually don't understand that scene. What did Nixon mean by the moon was far enough for now? That allowing gay marriage is further than society can manage now. Yay The Silence are dead! Does this gif work for anyone? Ok I'll just crawl back into my hole. I genuinely missed that. I thought Canton got his happy ending. Ok I'll just crawl back into my thicj hole. No, its frozen on one image. I wonder if Canton had to note the date and time of River's fall to make sure the Doctor was able to save her from plunging to her death.